Jamstar Review - How to Learn Guitar Songs Online? Jamstar was designed to change the way people learn how to play guitar and other instruments with an intelligent and fun tool that can listen to you while you play online. The traditional way of learning guitar or other instrument involve going to private lessons, reading and following many books and could have been a very long and difficult process. Apart of the theoretical knowledge needs to acquire it is normally a long process that require big ambition and continuity. The old way require you to sit and learn for many hours all the notes, memories them and practicing alone with the tabs. Internet helped many students not to feel alone all the time, an now you can see lessons on youtube and even seek for new tabs from many tab-website on the net. Nevertheless, many users complain that learning guitar alone online can be very boring. It was still missing some of the main fun parts of playing a guitar - The Feedback and the reaction when someone listen to you. 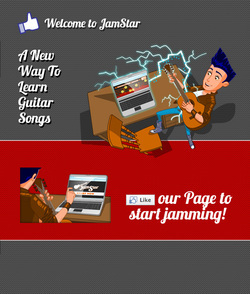 Jamstar is the next generation technology for everyone who wants to learn guitar songs online. It is based on an advanced technology and unique approach that can give you immediate feedback on your performance and improve your skills. Jamstar is a unique practicing tool that shows you the notes in beautiful graphics and help you learn the notes easily while it listen to you and motivate you to improve. All songs are tagged by levels so it helps you choose the right ones for you and advance as you succeed. JamStar is a true innovation in the instrument-practicing market. No more boring hours of practice, alone in front of a computer. With JamStar, users get a rock-star experience, and have lots of fun practicing their musical instrument of choice. When you connect to Jamstar you will start with tuning your guitar. All you do is let the computer listen the guitar and then follow the instructions until your guitar is tuned. Once you are done, you can start playing in level of difficulty you choose: Beginner, Intermediate or Expert. Jamstar has a breakthrough algorithm which lets you follow the tabs on real-time, play it and receive immediate feedback of your success. It also adapt the velocity to your skill and speed it up when you fill you are ready. It does doesn't matter what type of guitar you have, Jamstar work with any guitar. All you have to do is connect to the tool and start jamming! You will need to connect a microphone to the computer if you have an acoustic guitar, but for all electric guitar players it is as easy as connecting a chord to the computer and play. There is no need of an amplifier or any other tool. Jamstar also offer a variety of songs to choose from from different genres and its archive is getting bigger and bigger every day. If you like playing the guitar or want to start learning to play new songs you should try first Jamstar innovative practicing tool. With Jamstar you will have fun like playing a game and it changes the whole experience of learning guitar songs like never before. Once you'll start using Jamstar you probably wo won't be able to use any other way to learn and practice your guitar - be warned!